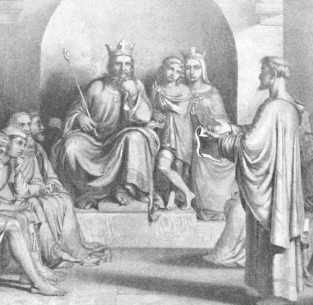 Caption: Alfred the Great, his son Edward and wife Ealhswith at the Witan -- Assembly of the Wise. 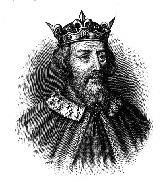 For an introduction to King Alfred, please see: King Alfred the Great. This entry is oriented toward the offspring of George Stratton and Melva Holloway Stratton -- who were the first Strattons to occupy Stratton House Inn. According to Howard Stratton's research -- and notes left by him -- four generations back from Sara Willits, Jane Foulke married Ellis Hughes in 1714. Jane Foulke was born in Monmouthshire N. Wales. She was the daughter of Edward & Eleanor Foulke who came from N., Wales with their 9 children and settled at Gwynned, Pa in 1698. Edward Foulke was the 26th generation from King Alfred the Great of England. For details, see: Holloway Family Tree.